Ozone Gaming might be an unknown player in the gaming peripheral market, but there’s no doubt it’s a solutions provider with ambition. 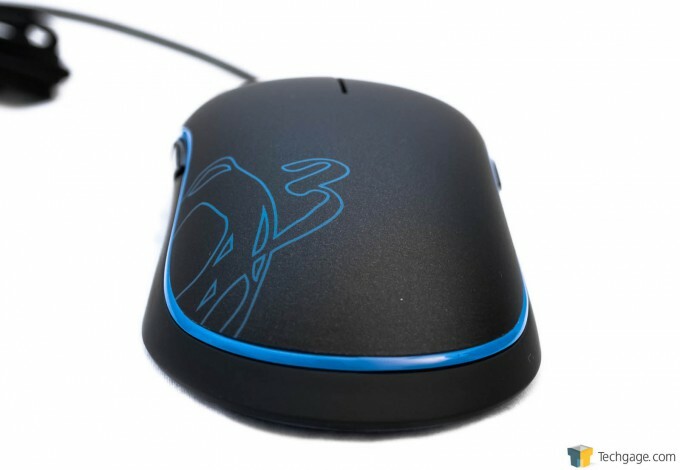 Today we take a look at two of its products, the Boson mousepad and the Neon gaming mouse. Read on for our review on this Ozone Gaming tag team. I was therefore a bit surprised that day when Techgage Head Honcho Rob Williams asked me if I wanted to have a crack at a couple of gaming peripherals from this company. Because yours truly is a curious cat, I said, sure, why not! Several weeks later, I received a box with a couple of Ozone Gaming goodies, the Boson portable gaming mouse pad and the Neon laser gaming mouse. Let’s have a look at both of them, shall we? The Boson package contains just the mouse pad itself, with no extras. 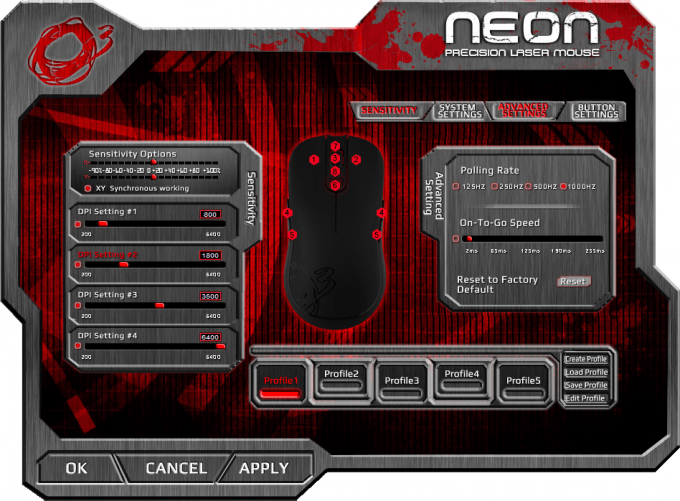 The Neon package, in contrast, contains not just the Neon mouse, but also a quick start guide, a mini-CD with software/drivers, and a square sticker with the Ozone Gaming logo. There’s really not much to the Boson. 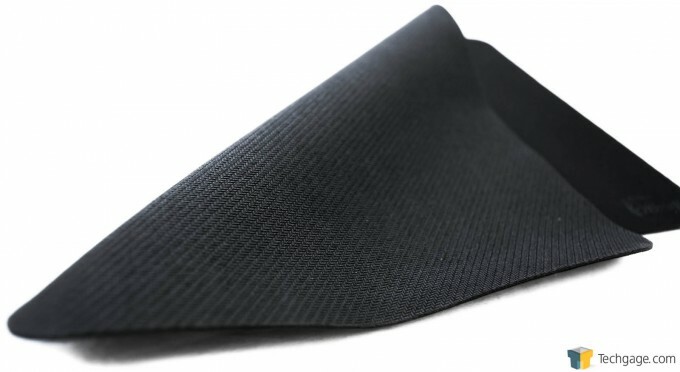 It’s a flexible mouse pad with a microfiber top surface and a no-slip bottom surface. It’s dressed in matte black. Its measurements are 7.7″ x 11.0″ x 0.05″ (195mm x 280mm x 1.27mm). There are two subtle concessions to visual flair on the bottom corners of the Boson. On the bottom right is “Ozone Boson” in a super-dark grey. And on the bottom left corner is a stylish “O3,” which, of course, is Ozone Gaming’s branding (O3 is also, not coincidentally, the chemical symbol for ozone). This is also in a super-dark grey which blends very well into the monochromatic matte black color scheme of the Boson. And here’s a look at the Boson’s no-slip underside. Moving on to the Neon, let’s have a look at our sample. 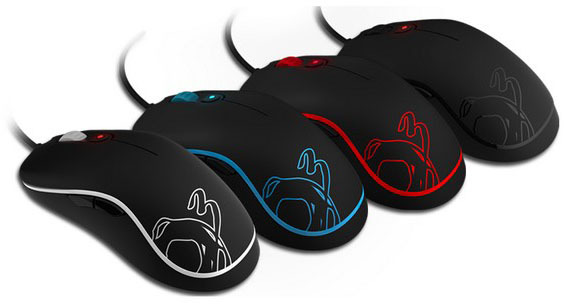 The Neon is a symmetrical ambidextrous mouse with eight buttons. Ours is finished in a very dark grey (not quite black) with a very subtle “metalflake” effect trimmed in blue. As mentioned, there are eight buttons on the Neon. There are, of course, the left- and right-click buttons and the clickable wheel. Behind the mouse wheel is a DPI switch. On each flank are a pair of buttons accessible to your thumb and ring finger. Here’s a look at the Neon in profile. The contoured blue belt line goes around the mouse, bisecting the Neon into its upper and lower sections with style. Not only does this blue trim serve as a visual divider, it also marks the point where the tactile characteristics of the Neon’s surfaces change. Above the blue line the Neon has a fine-textured rubber coating; everything below this line is a surface that is a little smoother. It cuts a clean profile, doesn’t it? The Neon’s rump is highlighted with a blue O3 logo on the left half. Two black low-friction feet stand out on the Neon’s all-blue bottom surface. The laser sensor emitter, meanwhile, sits just south of dead-center. 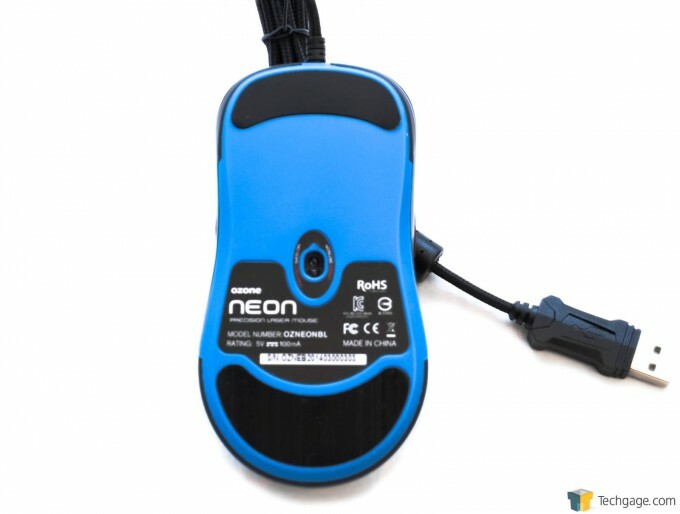 The Neon features a sleeved cable, which is de rigeur for gaming peripherals these days. 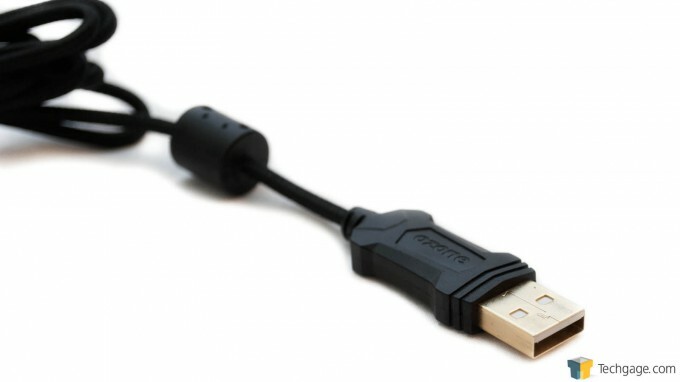 The cable ends in a light gold-colored USB connector. Now that we’ve had a look at both the Boson and the Neon, let’s put them through their paces. Evaluating the Boson is a pretty straightforward affair. I mean, it’s a mousepad. You put it on a surface, then you use your mouse on it. That’s the long and short of it, really. The Boson is small, but it isn’t too small. If anything, you get the benefits of a small desk footprint and maximum usable space. 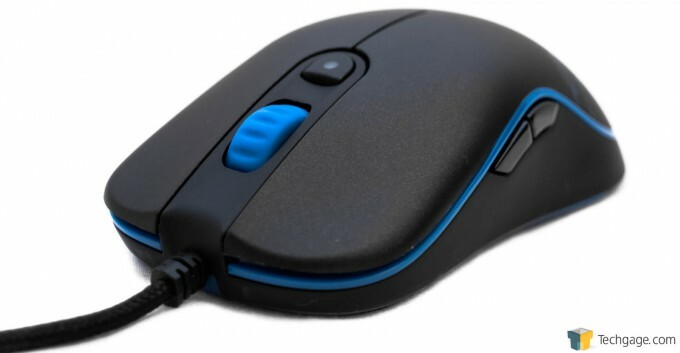 The microfiber top surface facilitates ultra-smooth movement, making mouse usage precise at any DPI setting. The Boson is also padded, which only enhances the comfort level you have when using it. 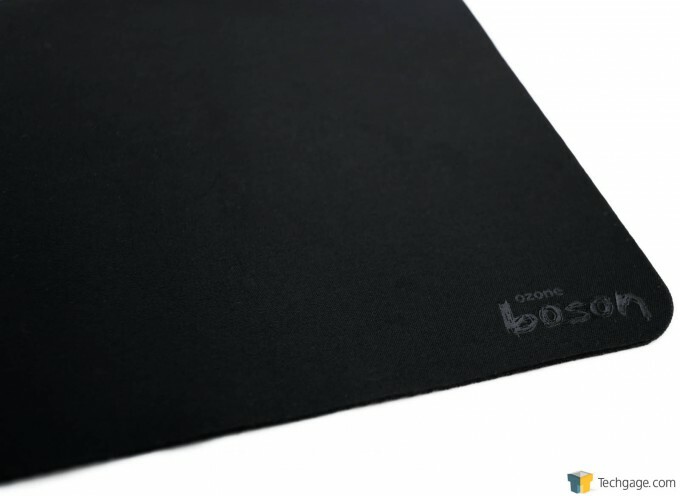 Ozone also says the Boson’s microfiber surface can also function as both a laptop screen protector (it’s apparently thin enough to fit between the keyboard and screen of a closed-up laptop) and a lens cleaner for eyeglasses. I don’t have a laptop to test this with, but judging by the Boson’s physical dimensions Ozone’s claim is reasonable. As far as using this mouse pad to take the dust off of eyeglasses, well, I tried it on a pair of shades: Bye-bye dust, thanks to the Boson’s top surface. Moving on to the Neon, well, testing mice is a bit more involved. You have more things to consider, namely, ergonomics, functionality, its software component (if it has one), and its perceived build quality. These are the essential criteria when it comes to reviewing a gaming peripheral. Ergonomically, the Neon is exemplary. It reminds me very much of one of my old favorites, which served me a long while as my daily driver mouse. Its buttons are well-placed; you never have to stretch or contort your hand to press them. And speaking of the buttons, pressing and clicking them doesn’t require a big effort, which suggests Ozone equipped the Neon with high-quality switches. The shape and dimensions of the Neon make it ideal for palm-grip users, though claw-gripppers can still use this comfortably. In terms of functionality, well, the Neon is a bit of a mixed bag. That might sound strange to you, given that it has eight buttons. Usually having eight buttons is a blessing, especially if they’re positioned ergonomically as they are on the Neon. Just based on these comments, you might think that the Neon mouse is fit for gamers as legendary as the mythical Deathspawner. However, the comments on the software component of this product will show precisely why the Neon’s functionality is less than optimal. First, though, here are some screenshots of the software’s UI. This part of the UI allows you to adjust DPI, the X-Y axis sensitivity, and to toggle X-Y synchronization on or off. System settings lets you set double-click speed, Windows pointer speed, tilt wheel scroll speed, as well as the mouse wheel scroll speed. Advanced settings control the mouse’s polling rate as well as a curious “On-To-Go” speed setting. By default, the polling rate is set to 500Hz, so you may want to change that to 1000Hz for superior responsiveness. Changing the On-To-Go, on the other hand, doesn’t seem to create any effects that I could perceive. Finally, button settings allows you to assign functions to the Neon’s eight buttons. Note that you can save up to five sets of settings in profiles that are stored on the host PC. Also, you can save, load, and edit profiles no matter what part of the UI you happen to be in. Now that we’ve had a look at the Neon’s software, let’s backtrack a bit and describe the mouse’s buttons in more detail. We’ve established that the Neon has eight buttons, and we’ve also established that the software does let you assign functions to them. During testing, though, I found that the software has a serious limitation: The pairs of buttons on the Neon’s flanks (designated as Buttons 4 and 5 in the UI) are basically mirrors of each other. What this means is that you can assign only six of the eight buttons with distinct functions. I’m not really sure what Ozone is thinking with this design decision. It’s not an ergonomic advantage (at least, as far as I’m concerned) to have a mirrored pair of buttons on the mouse’s flanks. What it does, though, is render the buttons on the right side (for a righty; flip for southpaws) completely useless; they may as well as not be there if they don’t do anything different from the thumb buttons. 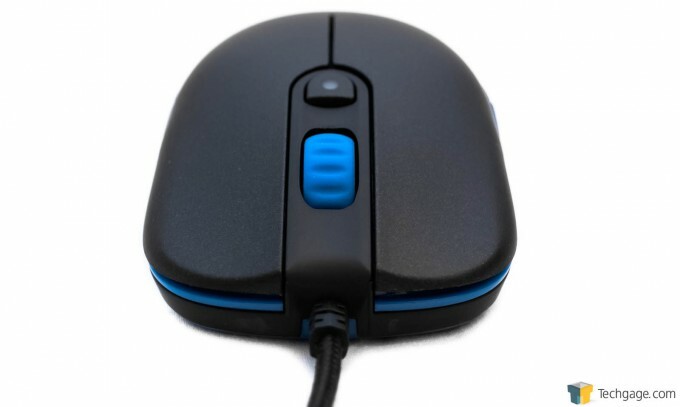 The Neon, therefore, is in effect a six-button mouse with eight physical buttons. This is such a big letdown, since, well, the Neon feels like a pretty good piece of kit. The build quality is solid overall. The plastics do exude a certain impression of fragility, but I think than perception has more to do with the Neon’s light weight than any flex, give, or any other perceptible indications. I love the rubber coating on its top surface: It aids ergonomics by giving the Neon a grippy (yet not sticky) upper surface, and it evokes the feel of more expensive mice. I also like the feel of the buttons, which, again, feel like they’d be right at home on a more expensive product. Ozone Gaming may not have the name recognition of many of its competitors in the gaming peripheral market (and there is a legion of them out there), but its products are definitely worthy of consideration even amidst such a crowd. Take the Boson. It’s a humble mousepad, sure, but it just plain works as advertised. You can take it anywhere, and you’ll never accuse it of being a waste of space on your desk. Plus it doubles as a laptop screen protector; you can even use it to wipe dust off of your glasses! Plus it looks really good in all-matte black. For $12.99 it’s a steal. I like the Boson enough to consider it as my primary mousepad. My current one is too big and I never use all of its space. The Boson, on the other hand, seems to be ideal for my needs. The Neon, though, is a little tougher to get enthusiastic about. It’s not that it’s a bad product. The hardware is solid enough, and I can’t think of anything big to complain about. However, the software really lets this mouse down. There’s just no good reason to waste two buttons by mirroring another pair of buttons’ functions on them. The $64.99 MSRP on the Neon isn’t exorbitant, but I really am having a tough time justifying the decision to buy one knowing that the software will only allow six distinct functions for its eight buttons. Even at $49.99, which is the lowest price I’ve found for it, it’s a tough pill to swallow. That’s how big of an issue this software-induced limitation is to me. It’s a crying shame, since otherwise I’d be happy to recommend the Neon sans reservation.